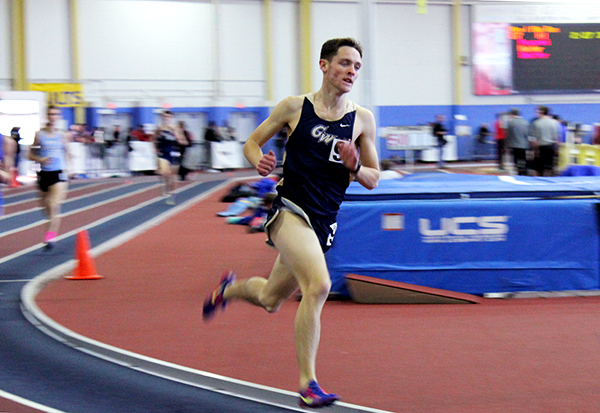 GW Track Team freshman Carter Day runs a 4:24 mile, finishing sixth of 26 in the men's mile at the Maryland Invitational. GW has a track team. Ask members of the small squad sporting new swag on campus and they might roll their eyes at you, give a whole-hearted chuckle and then explain, yes, GW reinstated track after 86 years. “Probably the most common question I get it is, ‘Oh, are we building a track?’ And the answer is ‘no, we are not,’” sophomore Seamus Roddy said. That doesn’t bother Roddy, though. Rather, it’s been a rallying point for a team that’s been extinct longer than GW football. The last time the Colonials rounded circles competitively was 1929. Now, in their first year as a team, the upstart group has found a home at the Georgetown community track, a couple miles north of Foggy Bottom. The track is a humble 300 meters, and from the fourth and final lane, it still doesn’t gear up to the standard quarter mile. It’s overshadowed on the north side by Georgetown row houses and littered with orange cones knocked on their sides. A long jump pit is the host of dead grass and muddy winter dirt. This past Saturday, GW competed in its second track meet of the season, following a pre-winter break meet at Navy. It was the first meet for the women, out at the Prince George Sports Complex next to FedEx Field. The six of them, five men and one woman, spent the day running one race apiece, split between the mile and the 3,000-meter run. One of the five men had a top-eight finish, the minimum result to get points in a scoring meet, with freshman Connor Day coming in sixth out of 26 runners in the mile. Graduate student Hannah Rowe came in second out of 29 in her 3,000-meter run. It was a groundbreaking of sorts for the team. While cross country has been around for a while at GW, the program has struggled to develop a running culture for athletes who want to run all year round. But the new program has already been a draw. 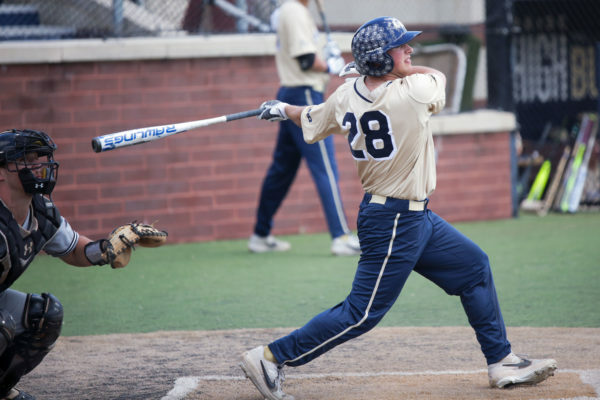 Freshman Luke Dublirer was tempted to go to school in a warm climate, perhaps in California or Miami at schools that had year-round programs, but chose GW when he heard about the reinstatement. Arnold, from Melrose, Mass., had never run cross country. He chose to come to GW independent of the sport, as just a university in a city he enjoyed, and headed down to D.C. with his mother for one last revisit to confirm his choice. When Arnold approached head coach Terry Weir to ask if he could try his luck on the cross country trails, Weir had a welcome surprise for him. “It was exciting when I heard there was a track program because this is what I’m used to,” Arnold said. Weir then offered him a spot as a walk-on. On Saturday, Arnold competed in the mile – his first race since high school, since he, like many of the other freshmen, declared a redshirt for the cross country season. She’s in her first year too. Though a strong cross country runner in her days at Virginia, France also knows her track. 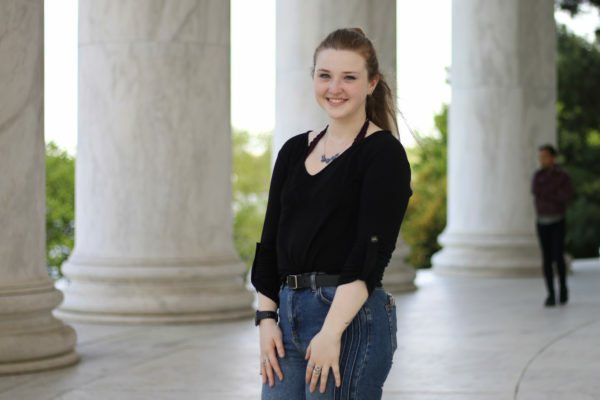 She was manager and volunteer assistant at South Carolina last year while completing her graduate degree. But after finishing up at the SEC track heavyweight, France is helping Weir build a program from the ground up. France said they are currently looking to compete in the 400-meter race and up, including a 1,600-meter relay and 60-meter high hurdles, but said the goal down the road is to have a full track and field team with sprinters, throwers and jumpers to complement the distance runners. It will be tough to transform the current hodgepodge of athletes, a rogue band competing without a real practice facility, into the type of program that could win a conference championship, especially with the current number of eight scholarships among the 33 roster members of men’s and women’s cross country, indoor and outdoor track. “We’re trying to be patient,” France said. For now, the Colonials face a two-mile warm-up to practice on a 300-meter community track in the heart of Georgetown. It’s an uphill run to the four-lane circuit, but no one seems to mind. “When we look back on this in two years, we’re going to say this really shaped us, being kind of a fledgling team that was trying to get better. That shapes us,” Roddy said.